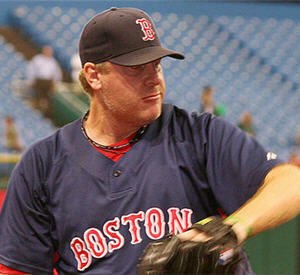 As a Boston sports fan it is hard to argue Curt Schilling’s role in the Red Sox folklore. How can anyone forget the bloody sock incident? Though Schilling has been out of baseball since 2007 he continues to be in the spotlight because of his many roles in the Massachusetts community and in business. He has most recently been chosen to be the speaker at the Worcester Polytechnic Institute’s commencement this May 2010. Thankfully this new honor in Worcester will overshadow the strange controversy regarding Schilling’s former doctor, the very one that worked on the bloody ankle. The Worcester Telegram is reporting that the former Red Sox team doctor Dr. William Morgan has given up his license while he is investigated for something that has not been made public yet. Dr. Morgan was also the team doctor for the Worcester Sharks until last year when he apparently left St. Vincent Hospital. Since Schilling’s departure from professional baseball he has gone on to be more vocal in politics and the charities he is passionate about. He is a big supporter of ALS and even gives the proceeds from his WEEI talk show to that cause. Schilling and his wife also have their own charity The Shade Foundation that focuses on sun safety due his wife’s own bout with melanoma. He and his wife are involved in other causes as well. The WPI press release brings to light something that may not be as in the spotlight as some of these other things. Schilling’s company 38 Studios has been involved in supporting students at the Interactive Media and Game Development program that was started in 2005. The game development industry continues to evolve and Schilling’s company is growing in anticipation of the growth in online multi-player games. It will be interesting to see what insights Schilling will share with the graduates in May. His varied background and interests are sure to make for a treasure-trove of advice.